Tea has been around longer than any of us can remember. It began in China, eventually making its way to Russia and through Europe, becoming a part of everyday life. The drink quickly became an upscale favorite. It wasn’t long before the British aristocracy got a hold of things, eventually leading to those fancy tea sets we all know and admire today. 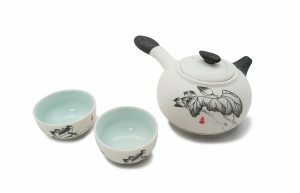 Tea was born in China, so it stands to reason that the earliest tea sets originated there as well. Tea sets were first made of porcelain, either white or light blue. There were no sugar dishes or cream dispensers, but instead tea leaves were mashed into patties or cakes and heated in bowls. It was many years later the tea pot showed up, believed to have been invented during the Song Dynasty (960-1279 AD). The oldest known discovery was a Yixing tea pot. Glazed ceramic tea pots and bowls came later, also thought to be a product of the Song Dynasty. Familiar items from tea services today, like creamers, sugar bowls, tiny pots, cups, and strainers, were all first added to tea sets in Europe. In Holland, tea rooms grew and prospered as the drink’s popularity increased. The Dutch added portable tea sets in restaurants and taverns. In Russia a samovar was created and placed in many quality homes. It is said this device was massive, and capable of producing almost fifty cups of tea at once. Tea grew in both popularity and opulence as the drink spanned more countries and places. Creamers were added to tea services, followed by the sugar basket, and then sugar bowls with little feet and disk shaped lids. In Germany children’s sets were made of pewter and copper. It was only a matter of time before the famous silver sets arrived, often including shiny tea pots, cups and saucers. The first silver tea service, equipped with a creamer and a sugar bowl, is supposed to have been made in 1627, but it was not until the Victorian age when a full six piece tea set showed up, including a sugar bowl, creamer, tea pot, kettle, waste bowl, and a coffee pot. Eventually, come the mid-18th century, tea services were on tables throughout Europe and even America, ranging in quality, design, material, and lavishness. Tea sets are more than just handy when it comes to dispensing a drink. It is not difficult to find antique sets, or maybe you already have one in your home; sometimes valuable tea services will have been passed down from one generation in a family to the next. With the history of tea sets and their origins, more than simple usefulness comes from owning one. Elegance is part of every cup and kettle, so enjoy your next with a spoonful of history.